Travel blog of David Spiegelhalter. Aiming to fill up retrospectively. 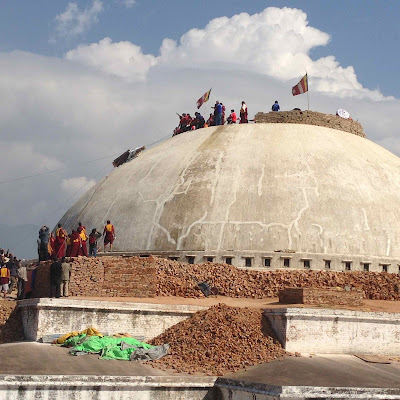 The first morning here we went down to the damaged Stupa, sad to see the state it was in, with all the brick structure on top of dome demolished. But we also found huge crowds, mobs of monks, and a row of high lamas on thrones of varying highness. Clearly something big about to happen. We had no idea what, but jostled among the river of people, and found a 'band' waiting for things to start. 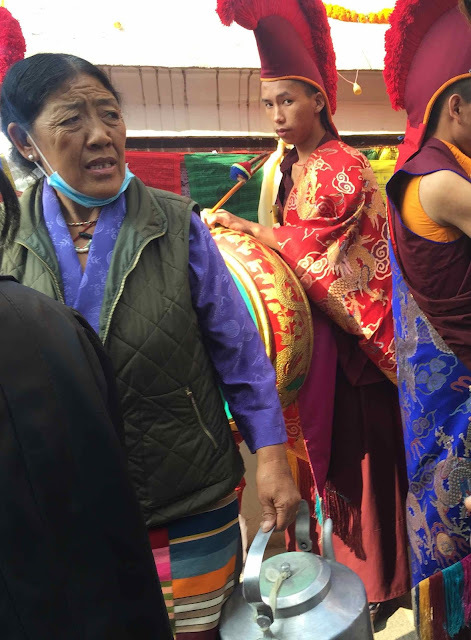 Ladies were passing round butter tea from huge kettles - an acquired taste. The big hats were out, and the horns ready, but we still did not know what was going on. 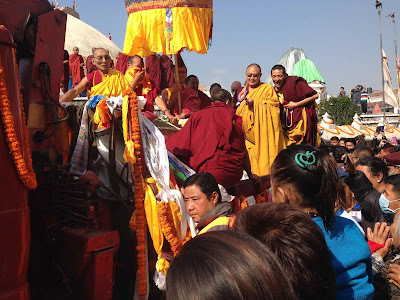 Then we realised that the monks on the back of a truck were collecting offerings from the crowd, stuffing the katas (traditional silk scarves) into a hollow container, and separating out the money. We quickly bought a kata, Kate shoved her way to the front in good Tibetan style, threw it to them, and in it went. 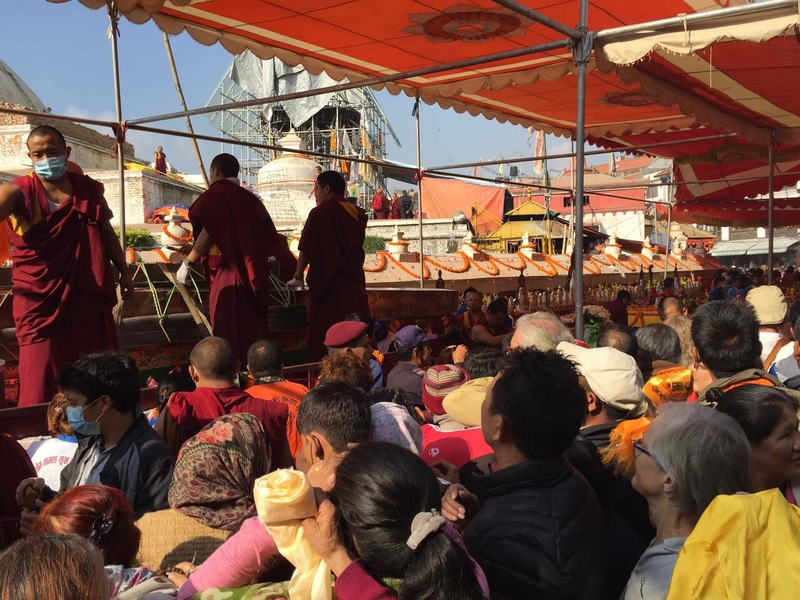 We finally realised that this was all going to go into the stupa before it was restored, and felt so lucky to be able to participate. Just as well we moved quickly, as suddenly the musicians started up. The boy on the left had the job of carrying the front of the trumpets, and didn't seem too pleased about it. No ear-protection provided. 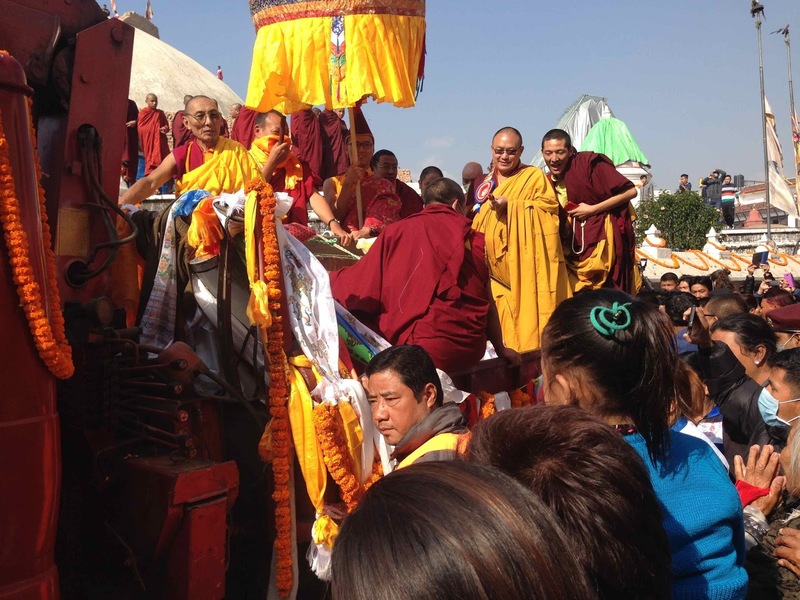 More monks piled onto the truck, clearly having a great time as the procession pushed through the crowd, preceded by the musicians making a wonderful noise. They all went right round the stupa, and then a crane lifted the pillar onto the platform below the dome. The issue was, how were they going to get it up to the top? We got a ringside seat in a cafe, and, along with everyone else, settled down to see if it would all end in disaster. The organisation was excellent, although a health-and-safety nightmare. 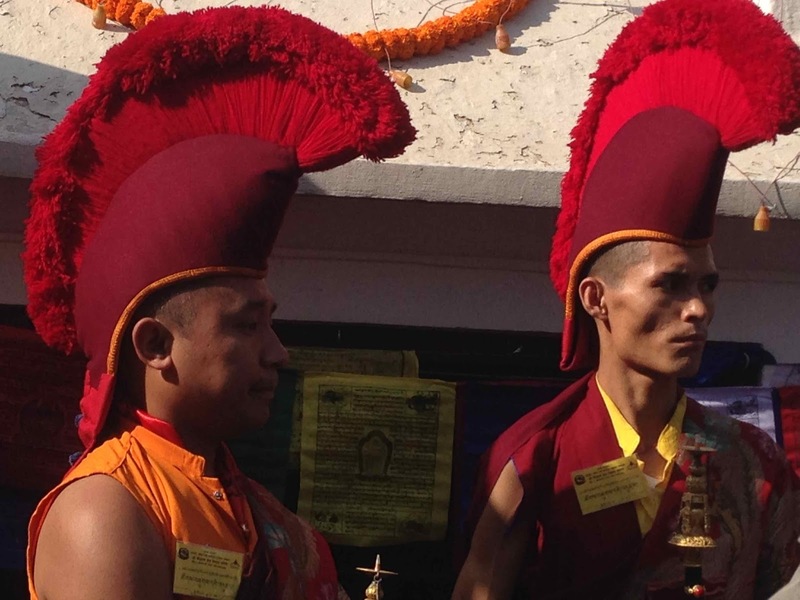 Muscular young monks clambered over the rubble, tying the pillar to a chain that was strung between the crane and the top, where a cheerful gang stood and hauled it up. Fortunately it was not too heavy, and so nobody was pulled off the top, and it slid up the dome rather rapidly - it should have been slower for the full dramatic effect. 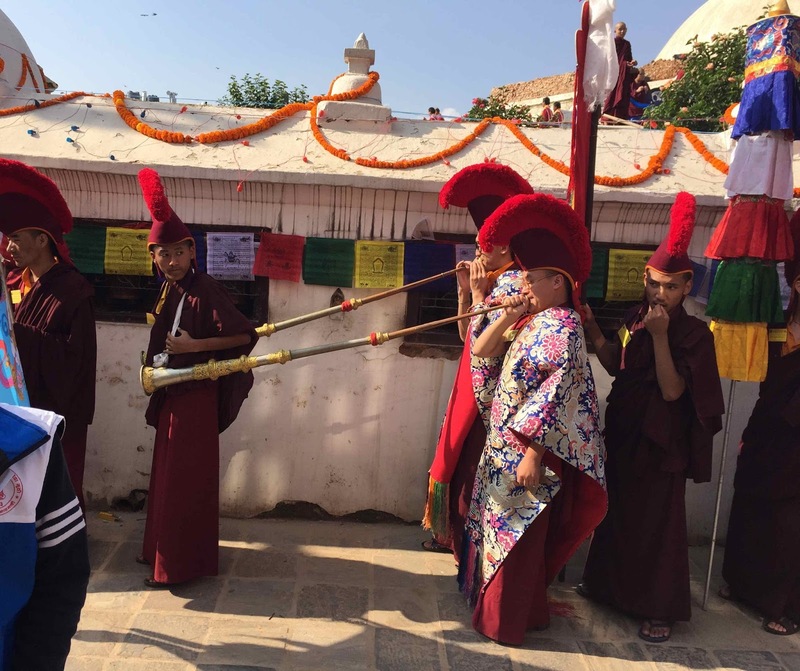 But it arrived at the top to huge applause, from both the crowd and a huge variety of monks and nuns, including the beautiful pink robes from Burma. And there it is now, sticking up in the air, waiting for the new brick pyramid to be rebuilt around it. And our little offering will be inside.